Recognizing the importance of the arts in a vibrant community, the Town of Barnstable established the HyArts District to enhance and enrich the quality of life for residents and visitors by coordinating and supporting activities promoting arts and culture. The HyArts Shanties provide local artists a unique, affordable harbor-front location to create and sell their work. The program expanded in 2018 with new shanties. Located on the corner of Pearl and South Streets in Hyannis, the HyArts Campus includes the historic Guyer Barn, Gallery Artrio, Bass River Pottery, and Studio 46. With its pedestrian friendly sidewalks, outdoor cafes, seasonal décor, events, and museums, Hyannis Main Street is the ideal destination for your Cape Cod experience. 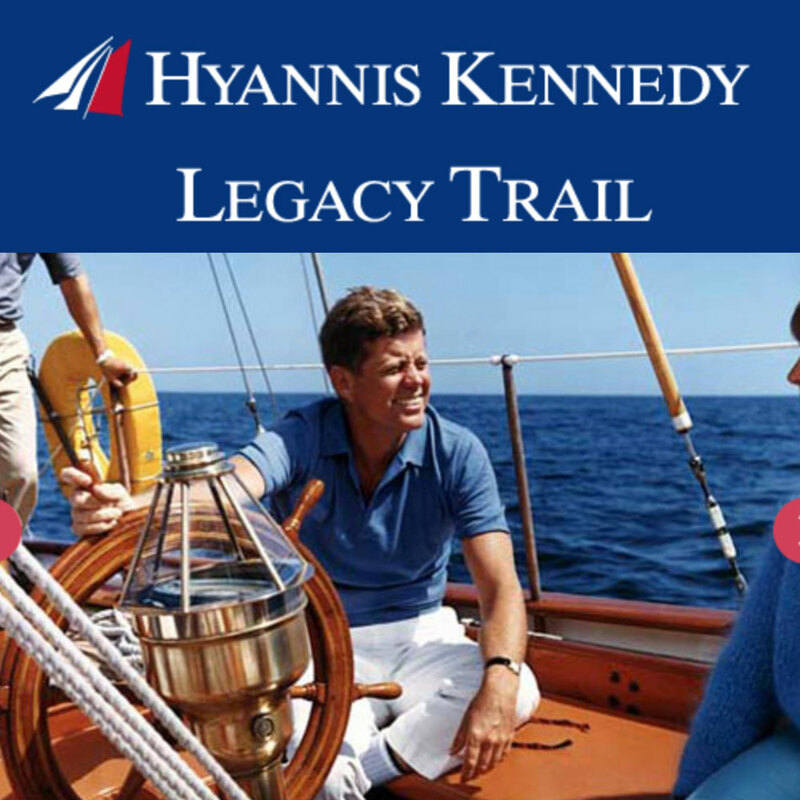 A self-guided walking tour of sites in downtown Hyannis, Cape Cod that are significant to the Kennedy family. The success of the Hyannis HyArts Cultural District is rooted in a series of arts oriented strategies designed to support the creative economy while creating c a vibrant backdrop for year round residents and visitors. 2005 HyArts Artist Shanties, Bismore Park Seven artist shanties were constructed on the harbor front. These shanties offer local artists an affordable location to create and sell their work in a beautiful and highly visible location. 2006 Aselton Park The rehabilitation of an underutilized grassy area into an outdoor performing arts center was completed and includes the award winning public art installation “Buoyed Coasts”. The area now provides a performing arts venue for festivals and a variety of entertainment along the harbor front. 2007 HyArts Campus Two homes were purchased on Pearl Street, adjacent to Main Street, and renovated by the Town into artist live/work and shared studio/gallery space. These properties encompass the backbone of the downtown arts district. The campus includes the Guyer Barn, a year round community art space, working artist studio and professional artist gallery supporting and promoting the arts through exhibits, education and performances. a strong community commitment to further enhance the vitality of the area. villages and in all seven villages in town. for artists to improve business, marketing and selling skills. A strong creative economy provides the opportunity to capitalize upon regional dollars with an area unified and transformed into a distinct arts destination. This cultural district continues to increase the value of the arts in the community through the cultivation of diverse new audiences and keeps consumers coming back throughout the year. District branding and cultural activities such as historic walking and art gallery tours, artist shanties and work studios, classes, workshops and exhibits serve to attract visitors to the area. The Town of Barnstable has a long-established commitment to making arts and culture an important facet of the town’s economic development strategy as the Arts are often undervalued for the contribution they play in a stable, well educated, vibrant community. The benefits of state designation are numerous. In addition to state wide and national marketing opportunities, the Hyannis HyArts Cultural District and the Barnstable Village Cultural District work with the MCC and community partners to further develop current arts related economic development strategies, including encouraging business, job growth and expanding tourism. Hyannis is the largest of seven thriving villages that make up the Town of Barnstable, one of the fifteen towns on Cape Cod. The Hyannis HyArts Cultural District supports and promotes the venues and events that showcase the talent and creativity of our sister villages and the extended Cape Cod arts community.